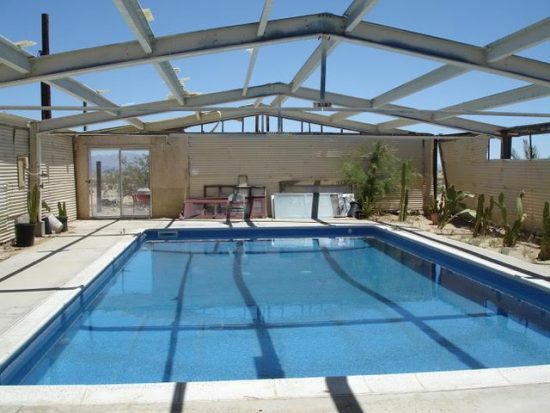 When LA resident Jamie Caffrey went looking for Twentynine Palms real estate a few years ago, he knew he wanted a pool. Driving out to view one listing, he found smashed windows, busted children’s toys and debris strewn everywhere. 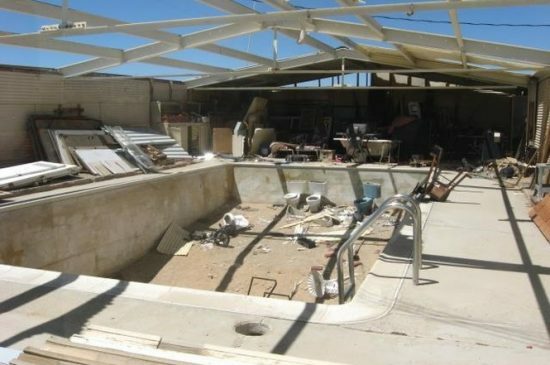 There was indeed a pool–once a gathering place for the desert artists–but now it was just a dark hole in the ground. So it happened that the Irish-born Caffrey–he formerly worked in the music and film business in LA–came to the inadvertent rescue of the Hilton legacy. He purchased the dump for $85,000, and has embarked on a restoration that will surely boost Hilton’s reputation in the Morongo Basin and beyond. When I heard about the restoration going on at the Hilton place, I headed out to see for myself. I’d actually been there once before, when art dealer Dan Rohlfing, artist Kathi Hilton Garvin and I went on a nighttime reconnaissance to find the house where Kathi once lived. She hadn’t been back for 30 years and was distressed to find it looking like a bombed-out hulk. On my recent visit, I drove out the Amboy road and turned on Bagdad Highway. Passing the last vestiges of civilization, I forged on toward nowhere. The roads were dirt, the few old homestead shacks widely spaced. Nothing looked familiar. Just when I was thinking I was past the point where any rational person would live, I came upon it. The house didn’t look much better–from the street, anyway–than it had a few years ago. Jamie Caffrey came out to meet me. He’s a lanky, relaxed man with curly black hair and a cheerful attitude toward discomfort. Rehabbing a ruin in the desert heat requires an easy temperament. As soon as we entered the courtyard, I could see Jamie had made progress. Tons of trash had been hauled away; there were new ceilings and–most amazing–a sparkling pool. The Hilton pool has assumed mythic proportions in the memories of the neighbors and artists who once partied here. Not only was it huge, but it was filled with mineral water that bubbled from the ground at 140 degrees. Hidden behind the windbreaks that encircled the pool was a steamy rainforest of exotic plants and cactus collected by Hilton, an amateur botanist as well as a rock and gem collector. When Hilton and his second wife, Barbara, discovered this house in the early 1950s there was no pool–just one room with an alcove and a bathroom. They had driven out the rutted Amboy road when they came upon “the loneliest little house squatting on a hillside,” as recounted in the Hilton biography The Man Who Captured Sunshine. 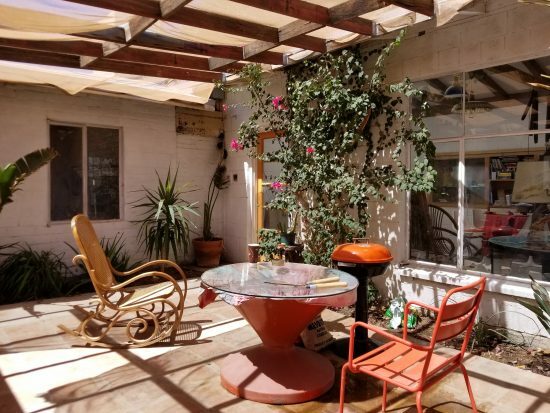 Recently divorced, Hilton had shuttered his Valerie Jean art and gem shop in Thermal, California, and had sold his home in Alamos, Mexico. 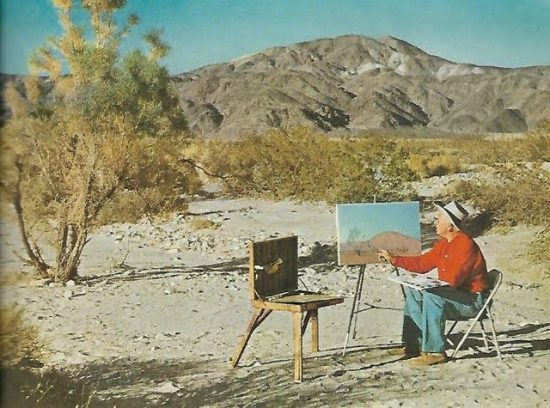 Weary of people and “pretty sick of life”, as he told his biographer, the legendary desert artist was hiding away in Twentynine Palms when he made the discovery. “There wasn’t another house within sight, but there was the most spectacular view of mountains on all sides, and silence–the most wonderful silence in the world,” said Hilton. John Hilton, from a 1957 National Geographic article on the California desert. At first, the couple hauled water and read by kerosene and coal lamp. While tearing down walls and mixing cement, they picked up radio from a Catalina Island station and kept an eye out for cigar-shaped UFOs–sharing their findings with their ufo-ologist friend George Van Tassel. Slowly the house expanded. “Their house became the entertainment focal point of Twentynine Palms,” wrote Katherine Ainsworth, author of Hilton’s biography. 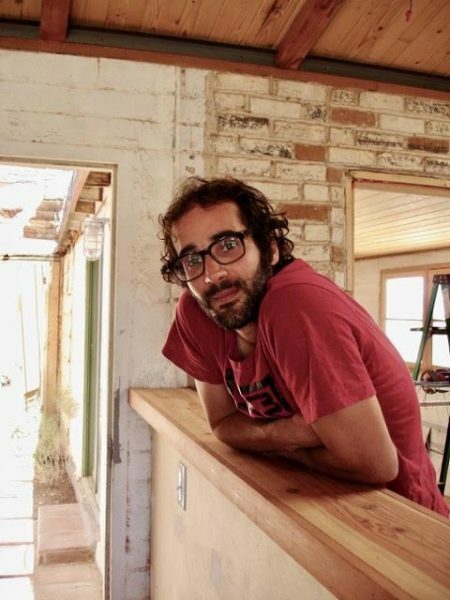 Hilton immersed himself in the local art scene, becoming a founder of the Twentynine Palms Artists Guild and the 29 Palms Art Gallery, still in operation. The Hiltons’ pool parties were populated by visiting artists, celebrities and generals from the Marine Base (early day Twentynine Palms residents mingled freely with the military). Artists like Bill Bender and Jimmy Swinnerton were regular guests. Given Hilton’s friends at the time, other visitors might have included Maynard Dixon, Norman Rockwell, Zane Grey, President Dwight Eisenhower, General George Patton, artists Clyde Forsythe and Norman Rockwell, and LA Times editor Ed Ainsworth. Twentynine Palms resident Jeffrey Dunn visited the house as a child and remembers lots of adults with cocktails and cigarettes milling around the pool, while Hilton–draped in turquoise–sang and played guitar for guests. “That was a pretty glorious era,” Dunn says. Brothers David and Thomas Brinkley have different memories of the fabled pool: both were baptized there. “We’d have Mormon baptisms in our pool because the only fount was in Palm Springs, 50 miles away,” Kathi Hilton recalls. 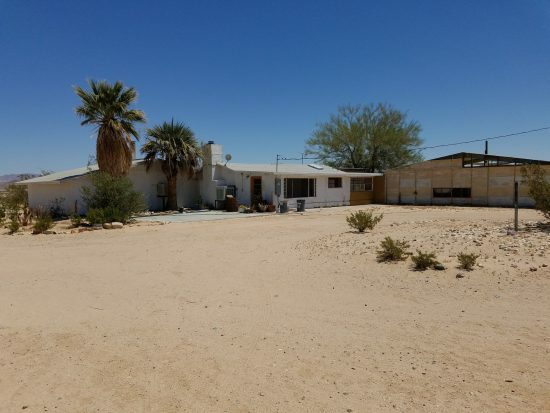 After Barbara’s death in 1976, Kathi Hilton moved into the Twentynine Palms house. (John Hilton moved to Hawaii, where he died in 1983.) Kathi was recovering from back surgery and was using the famous pool for rehab. Her friend Ute Mark pointed out John Hilton’s easel in the corner and suggested Kathi give painting a try. Maybe she inherited the artistic gene, Ute said hopefully. Ute went off to take a nap. By the time she returned, Kathi had painted a polished image of a moonlit Palm Canyon–her fledgling effort in a successful art career that continues today. Kathi–who now lives in Utah–had her own Splash House days in the house. Her tenure culminated in a huge party and exhibit for the Cowboy Artists of America. The artists set up easels by the pool; two Lear jets parked on the dirt strip out back. Her artist friends made a composite panting and all signed the back; the creation now hangs in Kathi’s living room. Barbara Hilton’s son Rick MacGillivary also made the pilgrimage to visit the house where he’d lived briefly as a boy in the 1950s. He found Hilton a demanding parent and cut his childhood stay short. “It was certainly a colorful family,” he now says tactfully. When Jamie Caffrey moved in, he set up camp in Hilton’s old studio and was afraid to venture into the trash-filled main house at night. The accidental preservationist has since become more at ease; the only unwanted guest so far has been a kingsnake who ventured into the bedroom. Jamie’s clean-up tasks. The two palms were planted by John Hilton. In the corner of Jamie’s room, where Hilton painted, there are ghost paint marks on the linoleum floor. Another ghost, Felica, has the run of the place. 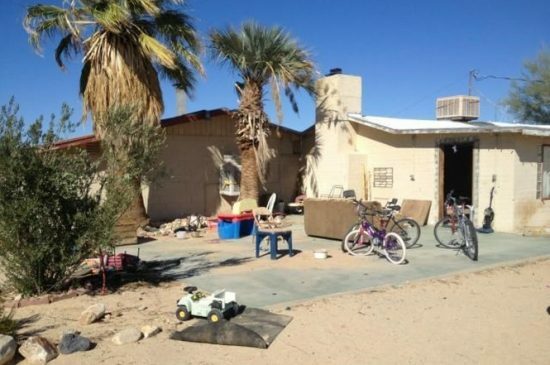 A mischievous 10-year-old poltergeist, Felica followed Hilton from his Alamos home–where she stole cigars and hats–all the way to Twentynine Palms. To appease the house spirit, Jamie has made Felica his WiFi password. The centerpiece of Jamie’s room is a blue-tiled firepit made by Hilton. In the artist’s day, built-in bookshelves filled with rocks and gems (he was an avid rockhound) lined the walls of his studio. Jamie is now filling those cabinets with mementoes of Hilton’s career, making for a house-museum effect. On display is a Harlow Jones portrait of Hilton (Jones was a 29 Palms photographer and a friend of Hilton’s), and a small Hilton oil painting Caffrey grabbed for $12 in a Morongo thrift shop. 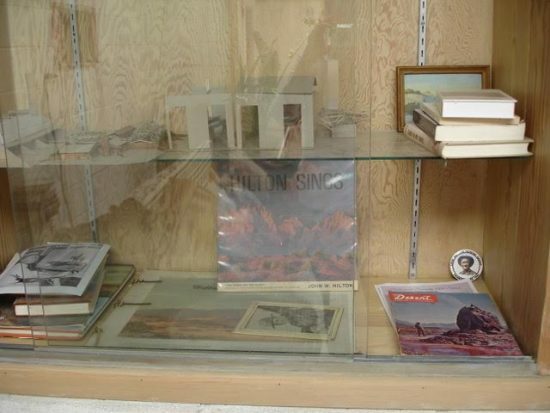 There’s a copy of Hilton’s Sonora Sketchbook and Death Valley Trails. 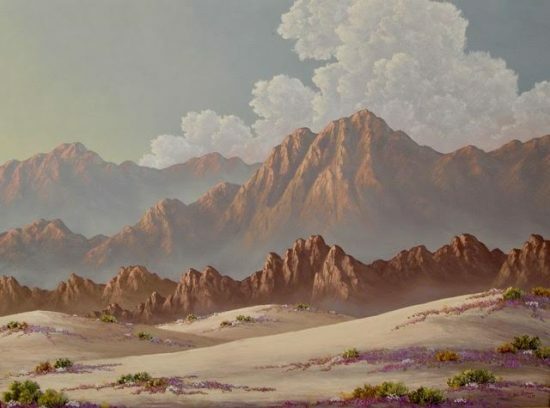 Hilton co-founded the Death Valley 49ers art shows, along with Bill Bender. Relaxing in the wood beamed studio, Caffrey can imagine Hilton painting in the corner while James Cagney lounges by the tile firepit. Cagney had a getaway home in Twentynine Palms and often came by to sketch and paint with Hilton. Jamie is carrying on the tradition of pool parties, albeit smaller gatherings than Hilton’s blow-out bashes. He’s introducing his friends to the legend of Hilton and the desert artists. Once the renovation is complete he may have exhibits or gatherings here to honor Hilton and the Smoketree artists. The painting Kathi Hilton gave to Jamie to display in her former home. For now he’s enjoying the space and solitude that John Hilton loved so much. He takes off running through the moonlit washes at night and looks back to admire the “loneliest little house squatting on a hillside”–not so lonely now that Jamie has come to stay. change as dramatically as mine did after I bought Agnes Pelton’s house? Hi Peter, Yes Jamie’s story does remind me a lot of what happened with you and Simeon and the Agnes Pelton house. I told him about you two and your own accidental preservation journey. i so enjoy your art house articles, dear ann! keep ’em comin! may the force be with you, jamie! 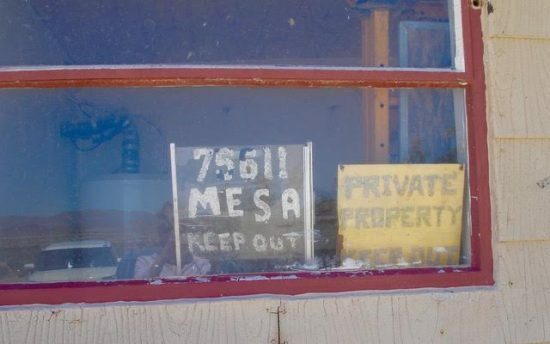 I am so glad to hear that another desert artist’s home is being preserved, and even museum-like, for John Hilton! Jamie, my hat’s off to you, Cheers! Thanks Ann for sharing this story. Great article!! There is so much to learn from the desert. Wonderful, wonderful piece! The power of desert magic. Something happens to you out there–ineffable and mysterious. You go Jamie. Thank you for all your work and vision. My great-aunt Eunice was married to John before Barbara. 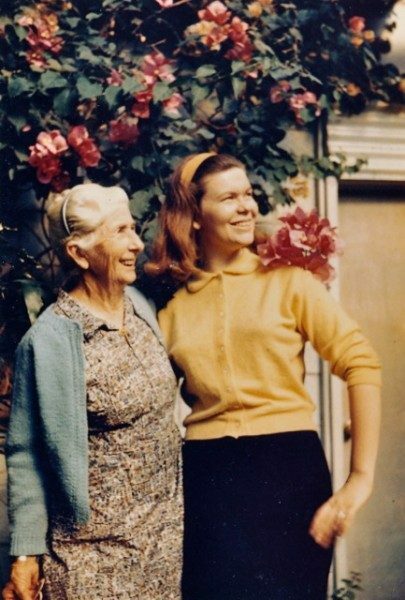 I met and visited with Kathi when I was a little girl, and I always remember her as being a beautiful, gracious woman to a curious, awkward little girl. My mom and sister inherited 2 paintings of Uncle John’s when my grandma died. Alas, they have not been taken care of well, and are crazed and in need of restoration, but the light still shines in them. 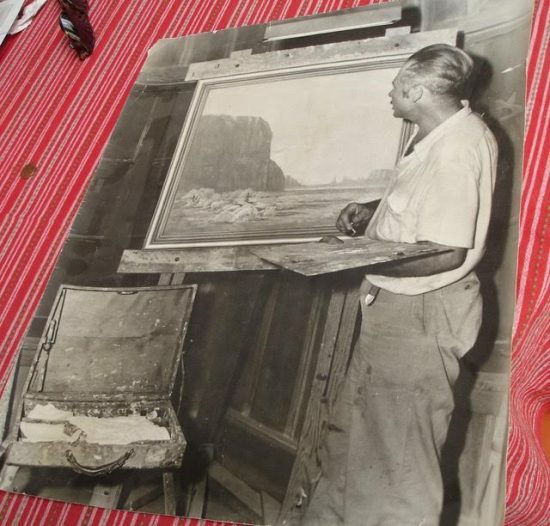 The family story is that my grandma was given them as a gift for proofreading/typing his Sonora Sketchbook, and that one of them was the first painting he did with a palette knife. Even though I never met the man, I heard stories from my Aunt Eunice, and her son Philip. So glad his home is being renovated. Thank you.